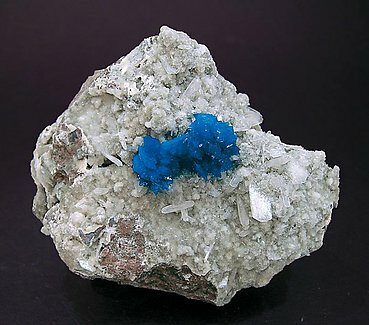 Cavansite forms groups and isolated acicular crystals of an intense blue color that cover a group of crystals of Stilbite. An original sample. Very well defined spherical growth of small dipyramidal crystals of Cavansite, on a matrix of basalt coated by crystals of Stilbite. 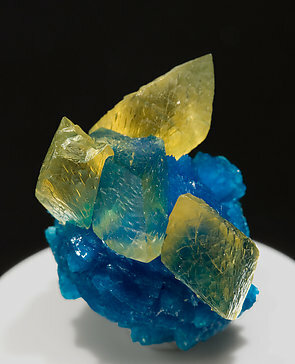 Group of very sharp crystals of Cavansite with a very intense color and luster and some of them doubly terminated, with four rhombohedral crystals of Calcite, transparent and with a clear yellow color. One of the few samples found with this association. 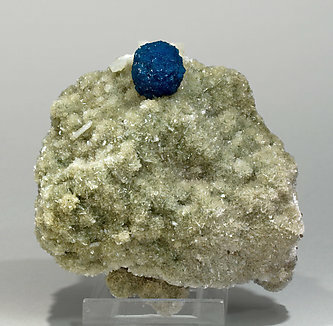 Floater spheroidal aggregate of Cavansite crystals with a very intense color and luster, with four very acute rhombohedral crystals of Calcite that are transparent, with vivid yellow color. One of the few samples found with this association. The specimen is really aesthetic. 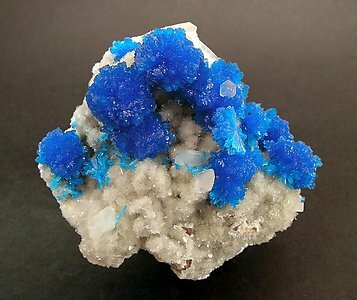 Cavansite crystallizes as numerous spherical groups, and as some single sprays of crystals, of a very vivid and deep color. 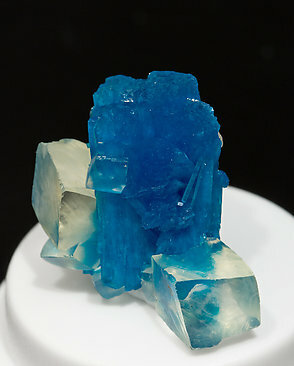 We must mention the presence of a crystal of Calcite, very aerial, on the Cavansite. 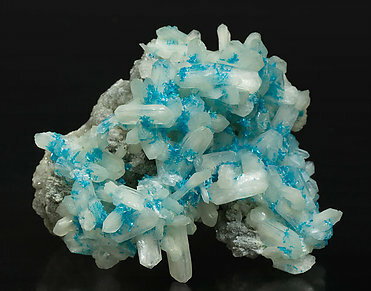 Groups of very bright blue acicular crystals on doubly terminated crystals of white Stilbite on basaltic matrix. Unlike other Cavansites this one has thick tabular crystals that are well separated from each other and are very luminous. They are perfect and well positioned on the Stilbite matrix. Much better than many of the other Cavansites we have seen. 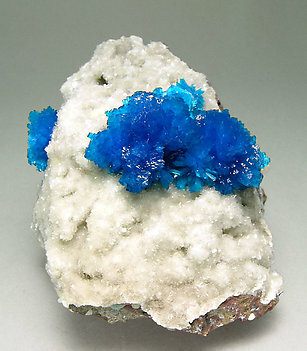 Groups of very aerial Cavansite crystals with an excellent luster. 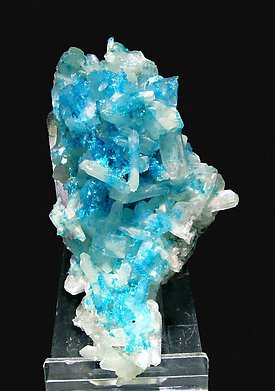 Color is very deep and intense and contrasts with the white Stilbite matrix.